In the winter, the cold and flu season is upon us. With the erratic weather changes influenced by La Nina, temperatures can rise or fall 20 to 30 degrees overnight, which can upset our immune systems, leaving us vulnerable to viruses. There are many excellent essential oils that I have written about in past winter articles which combat the effects of the flu; most notably tea tree, eucalyptus, black pepper, rosemary and sandalwood. This month’s Cinnamon can be included in our list of infection-fighters. There are two varieties of this essential oil— cinnamon bark and cinnamon leaf. Each is steam distilled from its appropriate cinnamon zeylanicum source, although as a general rule, cinnamon bark is stronger and can be a skin irritant so is rarely used in massage. Cinnamon leaf oil is therapeutically used for circulatory problems, digestive disorders, skin care and as mentioned before for immune integrity. Cinnamon has a warming effect on the body. When rubbed on the chest in massage oil or when added to a bath, it can chase away flu symptoms such as chills, achy joint pain, tense contracted muscles and fatigue. It stimulates the circulation helping the immune system’s fighters to kill off infection and discard the dead cells in the proper eliminatory channels. Cinnamon is sudorific, encouraging perspiration, which aids in detoxifying the infection. Colds/flu can cause debility and exhaustion. Cinnamon, when steam-inhaled or used in an aroma lamp can help stimulate the mental processes and enliven the spirits, especially if the person is housebound and stir-crazy during illness. 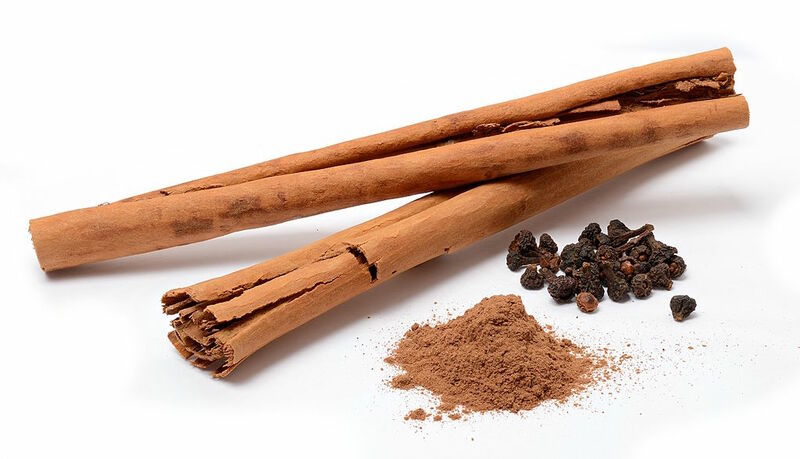 A stick of cinnamon, crushed and steeped in hot water (with a bit of honey), is wonderful for the digestive system. It warms and soothes upset stomachs and can alleviate flatulence and bloating. It can internally heat the body, especially when one is shivery and has that bone-cold feeling. As mentioned before, cinnamon helps with achy arthritic joints, stiff and restricted muscles and poor or sluggish circulation. It increases scanty, difficult menstrual flow and warms and soothes cramping of the uterus. Increased blood flow supports the heart and cinnamon is very useful for weak elderly people who live a sedentary life or for those recovering from a debilitating illness because it increases circulation. Also because cinnamon is an uplifting oil, old people who can’t get out much and who become depressed from loneliness can feel rejuvenated and have their fears of isolation alleviated when this oil is burned. On an offbeat track, cinnamon is noted for killing head lice and scabies when used topically in a liniment or in oil. As with all essential oils, cinnamon is too strong to use directly on the skin, although it can be dabbed on specific problems like bee stings or warts. Throughout the ages cinnamon has been used in rituals to ward off evil or malicious spirits and because of its enlivening properties, it was included in many celebrations. It is also a noted aphrodisiac. On a psycho-spiritual level, this oil when burned in an aroma lamp can aid in meditation and can help increase psychic abilities. It promotes creativity. Cinnamon has also carried the belief that when used in ceremony, financial prosperity can be attained. And who couldn’t use a little prosperity now that all the Christmas bills are coming in to be paid! Listen to a meditation on cinnamon.